Home > Green Christmas > Should You Get a Real or Fake Christmas Tree? If you had to pick one thing that really makes Christmas what would it be? In most cases it’d be the tree. The focal point of the room, the Christmas tree is the tradition that really gets us feeling festive. 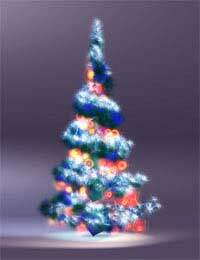 But when it comes to your Christmas tree should you be opting for a real one or an artificial tree? And which one is better for the environment? For some people there is no question about it, it’s fake trees all the way. And it’s not hard to see why. Fake trees are certainly the cheaper option since once you buy one you can use it for years and years. After each Christmas you can simply pack up the tree and store it away until the next festive season begins. You may have to replace it once in a while but on the whole the tree will see you through many a year. New innovations have also meant fake Christmas trees are now even more beautiful than ever. You can buy pre-lit Christmas trees which saves you the hassle of having to decorate your tree with fairy lights – we all know how difficult it can be to distribute them evenly! And fibre-optic trees are fast becoming the tree of choice for the fashion conscious buyer. The tiny lights are embedded in the tree itself so you get the illusion of a dusting of twinkles without seeing wires or bulbs. For the busy shopper – and let’s face it who isn’t busy at Christmas? – there is the option of buying a ready-decorated tree so you literally take it home, pull it out of the box and voilà you have the perfect tree. But fake trees aren’t for everyone. For some people when it comes to the most important part of the decorations nothing beats a real, authentic Christmas tree. Real trees have that fabulous pine smell that just makes it feel like Christmas. Having a real tree makes the room look that bit more traditional and gives it a real old-fashioned feel. Many would argue the real tree is much classier than a plastic one. A fake tree can sometimes look just that, fake and far too polished to resemble a real tree. There’s also the ritual of going out and choosing your real tree. For some families this is one of the most important part of the holidays and missing out on this would be like missing the mince pies or the Christmas crackers. Which is the Most Environmentally-Friendly? The big question at the moment is which tree is better for the environment? Green issues are a priority with the threat of global warming looming ever near so it is important that we consider the environment at all times of year, including Christmas. There are arguments for both the real tree and the fake one. While having a real tree means cutting down a living tree every year, fake trees contain polyvinyl chloride which is not good for the planet. The greenest option is to buy a ‘live’ Christmas tree. These trees are dug up and planted in your own garden then when the season is over you can either leave it to flourish in your garden or give it back to the nursery where you bought it where it will be replanted. Interested to know how and when people started decorating trees at Christmas? Read on.